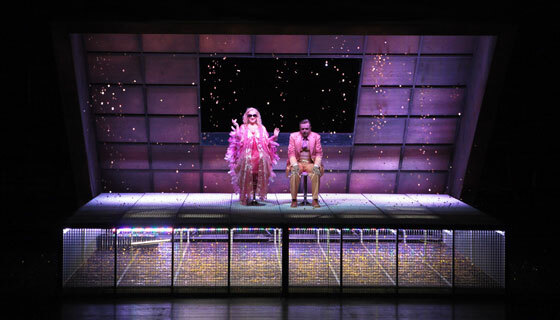 Among this year's smorgasbord of operas at the Munich Festival, none was more intriguing than the new production of Die schweigsame Frau, among the most rarely performed of Strauss operas. Given its rarity, it is easy to come to the conclusion that it is either poor music or impossible to stage. If the new production at the Munich Festival is any indication, it is neither. The score, simply put, is gorgeous, particularly the end of Acts 2 and 3. The production, by trail-blazing Australian director Barrie Kosky, is riotously funny, a Regie-Oper treatment that is frothy and thoroughly entertaining, yet never losing sight of the tender and philosophical core of the work. Done with two intermissions, the show at three and a half hours is not exactly short, but it's time well spent. And judging by the huge ovations at the end of the performance I saw on July 23, the audience thought so too. It is hard to believe that this gem has not received a modern staging in North America save for Santa Fe Opera's twenty years ago when John Crosby, a real Strauss enthusiast, was still alive and in charge. Based on a book by Ben Johnson and with a libretto by Stefan Zweig, it tells the story of the rich and elderly misanthrope Morosus (wonderfully sung and acted by Franz Hawlata) who cannot stand noise of any kind. His nephew Henry (played and sung with great charm by English tenor Toby Spence) and his barber (the excellent Nicolay Borchev) hatch a plan to trick Morosus into marrying a "silent woman" Timidia, who is really Aminta (the wonderful and heavily pregnant Diana Damrau), who is married to Henry, in order to claim the inheritance from the old man. Morosus falls for Timidia, and no sooner they're married that her true nature is revealed. Far from silent, Aminta is a member of a particularly noisy operatic troupe and the gang proceed to play havoc at the Morosus mansion. Like any farce, eventually the deception is revealed and Morosus realizes that he has been foolish and resolves to live his life with greater acceptance and grace. From that unlikely - and some would say rather unpromising - premise, Strauss put together a work of great charm when performed by first rank artists and a great orchestra. The Munich production certainly fulfilled the promise - to my eyes and ears, it is arguably the hit of the 2010 Festival. German coloratura sensation Diana Damrau, almost eight month pregnant, amazed everyone with her physical agility. She sang spectacularly as usual, some slightly pinched high notes notwithstanding. Her engaging stage persona was not in the least bit affected by her advanced stage of pregnancy. In fact, in some of the stage antics Kosky dreamed up, her expanded waistline was incorporated into the staging with hilarious results. There was also excellent chemistry between Damrau and Toby Spence. As Henry Morosus, Spence sang his music with bright, sweet tone, music that is some of the most treacherous Strauss wrote for tenors. His secure top and well focused tone were a pleasure. Being handsome and youthful didn't hurt either - his pairing with Damrau was totally believable. Given his success here, Spence will likely be in high demand as a Strauss tenor in the future. After a career of 24 years, Franz Hawlata's bass remains fresh and supple. The Kosky staging has Morosus as an almost "straight man", the victim of the antics of the other motley characters. Hawlata played this good-naturedly. Kudos to him for a lovely final aria "Wie schoen ist doch die Musik", the highlight of the opera, occurring in the last five minutes of a long evening. The supporting roles were all well taken. Catherine Wyn-Rogers was delightfully frumpish but sounding a bit wobbly as the put upon housekeeper Frau Zimmerlein, and Nikolay Borchev a youthful and energetic Barber. Barrie Kosky's set is deceptively simple. In Acts 1 and 2 it consists only of a rather innocuous raised platform. In the beginning of Act 3, the "lid" of the platform opens up, and in the process a torrential shower of gold pieces - symbolizing Morosus' hidden wealth - starts raining down (see photo). Seen on July 23, an audience surprised and delighted by this clever coup de theatre started applauding. A practice perhaps all too common in North America, applauding scenery is considered gauche in operatically sophisticated Europe. When Aminta's friends in the operatic troupe appeared in disguises, some of the gender-bending variety like the near-naked Las Vegas showgirl that's actually a male ballet dancer in drag, there were plenty of giggling from the titillated audience members around me. Kosky has managed to create an outlandishly funny and entertaining production that actually enhanced the drama without being offensive. Let's hope it will be videotaped for DVD in the future. At the end, all the principals received huge ovations, but none more vociferous than the one reserved for conductor Kent Nagano, whose affinity for Richard Strauss is well known. He shaped the piece with loving care, exciting in the farcical parts but never at the expense of the inherent poetry in the more serious moments. It was a performance that makes one wish Die schweigsame Frau is part of the standard repertoire. I had the chance to attend the 26th July performance and I can not but agry in all terms with you. The opera was not only quite well sung (the three main roles are very difficult), but the production enhanced the intrinsinc values of Strauss' score. Nagano produced a honest lecture of the score, too. I wish it would be issued in DVD, since this is a chance that can not be missed. The only problem is that Bohm's cuts were applied. It would have been a perfect moment for a reference recording. Even though there have been a recent production in Seville too, performances of this opera are quite rare. But I find it difficult to understand why this gem is not part of the repertoire.